As far as I know Jalfrezi is traditionally a curry with a dry thick sauce. Shamefully my only previous experience of Jalfrezi was from a jar and this gave quite a rich sauce. So that’s how I like it. Given how much we like the Thai red curry made from scratch I decided to try to a Jalfrezi too. It can range in heat from medium to very hot and in traditionally made with green chillies, which are hotter than red. I use red chillies and the recipe below gives a medium heat. So basically, this is nothing like the traditional dish! I pulled ideas from the back of sauce jars (ahem!) 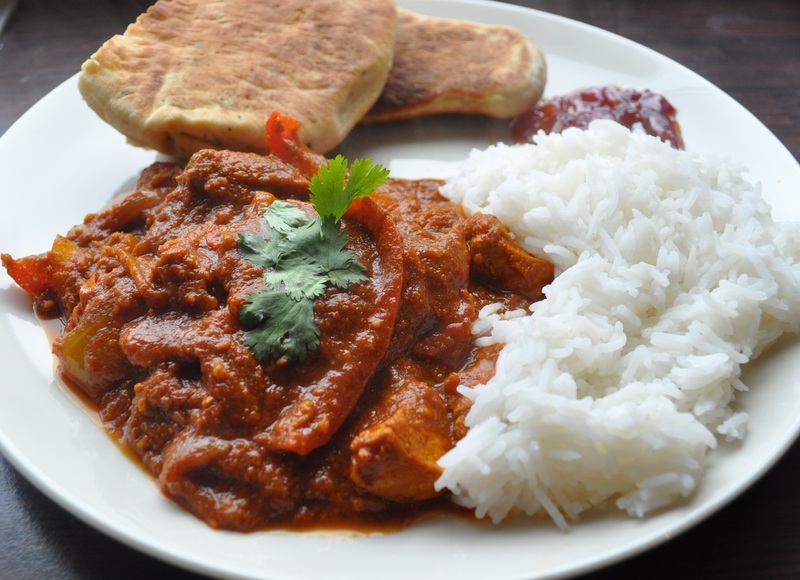 and various websites, including Jamie Oliver’s Vegetable Jalfrezi dish and came up this. One recipe suggested marinating the meat in a dry spice mix before cooking. I did this first time around. I then made the dish again as himself said it lacked sweetness. He was right, unfortunately. I don’t say that too often! The second time I didn’t bother marinating and added jarred peppers for sweetness. It tasted much better so I really think unless you are using a tough cut of meat, there is no need to marinade. I made this with chicken, but you could use beef, lamb or vegetables – cauliflower, butternut squash and spinach work well in the vegetarian version. It freezes really well. Heat the oil in a large pan over a medium-high heat. Add the mustard seeds and when they start to pop add half of the onions and the first lot of cumin, coriander and turmeric and the ground cardamom. Cook the onions until soft and then add the chicken and cook until sealed all over. When the chicken is sealed reduce the heat slightly and add the paste from the blender and cook for about 5 minutes. If using peppers or squash add them now. Put the chopped tomatoes, fresh coriander and fresh chilli into the blender again. You don’t have to make this too smooth, a bit of texture is nice. Add the tomato mix to the pan. Heat until it is about to boil and reduce the heat, cover and simmer for about 20 minutes. Add the peas now if you are using them, tamarind paste, sugar and garam masala and stir well. Simmer for a further 10 minutes. Add a small bit of water if you want to loosen the sauce a bit. Taste to see if it needs seasoning but you should not have to add salt. Serve with basmati rice. Additional extras you can serve are naan bread, greek yoghurt, raita, or the red onion mango relish in the pic below. This red onion mango relish is made simply by finely chopping a small red onion, cook over a low heat in some vegetable oil until soft and add the few table tablespoons of mango chutney. Delicious! After my meeting with the nutritionist I’m going to be making a lot from scratch (I’m terrible for using jars) so going to book mark this and try it over the weekend! Looks yummy! Thanks Sam, it is really tasty. I decided some time ago to try and make as much from scratch as possible. At least you know exactly what you are eating! 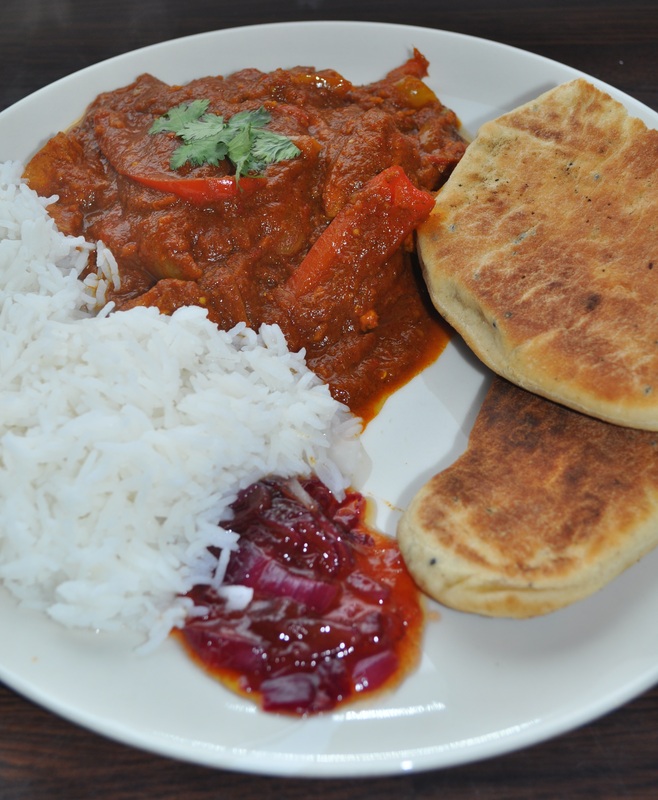 You can’t beat a good curry! ?